Keeps the brake applied after releasing the brake pedal until the accelerator pedal is pressed. You can use this system while the vehicle is temporarily stopped, such as when you stop at a traffic light. Activating the automatic brake hold system on steep hills or slippery roads may still allow the vehicle to move if you remove your foot from the brake pedal. If a vehicle unexpectedly moves, it may cause a crash resulting in serious injury or death. Never activate the automatic brake hold system or rely on it to keep a vehicle from moving when stopped on a steep hill or slippery roads. 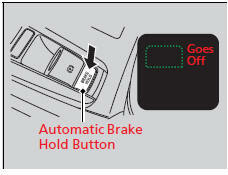 Using the automatic brake hold system to park the vehicle may result in the vehicle unexpectedly moving. If a vehicle moves unexpectedly, it may cause a crash, resulting in serious injury or death. Never leave the vehicle when braking is temporarily kept by automatic brake hold and always park the vehicle by putting the transmission in and applying the parking brake. • You depress the brake pedal and move the shift lever to or . 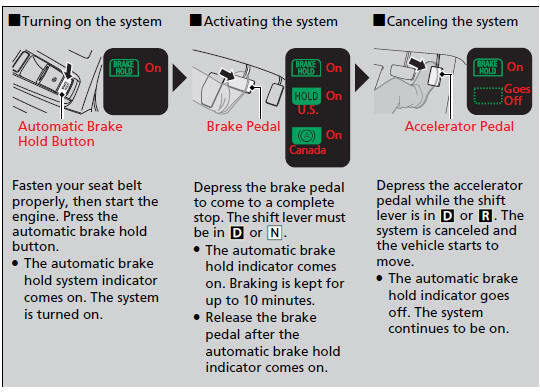 Under the following conditions, the system automatically cancels, and the parking brake is applied: • Braking is kept for more than 10 minutes. • The driver’s seat belt is unfastened. • The engine is turned off. • Brake Hold System Problem/CHECK BRAKE HOLD SYSTEM appears on the multi-information display. While the system is on, press the automatic brake hold button again. - The automatic brake hold system indicator goes off. While the system is activated, you can turn off the engine or park the vehicle through the same procedure as you normally do. Whether the system is on, or the system is activated, the automatic brake hold turns off once the engine is off. Make sure to turn off the automatic brake hold system before using an automated car wash.
You may hear an operating noise if the vehicle moves while the automatic brake hold system is in operation. The system generates sound while holding the vehicle and it moves.